The arteries of the head and neck allow blood to circulate properly on the upper parts of the systematic loop. The circulation originates from the aortic arch and the arteries supplying the blood, including the left common carotid artery, the brachiocephalic artery and the left subclavian artery. Blood goes from the head and neck through the jugular vein and the subclavian vein. The brachiocephalic artery or trunk is the largest artery and it branches out to form the common carotid artery and the subclavian artery, which are both on the right side. The artery is the one that provides the blood to the upper right part of the chest, the right arm as well as the head and neck. This is done through an artery branch called the right vertebral artery. The vertebral arteries that are on the left and right, in turn, go into the basilar artery and then upward to the posterior cerebral artery. This provides most of the oxygenated blood to the brain. Both the posterior communicating artery and the posterior cerebral artery can be found inside the circle of Willis. The left common carotid artery, in turn, divides and forms the ICA or the internal carotid artery and the ECA or the external carotid artery. 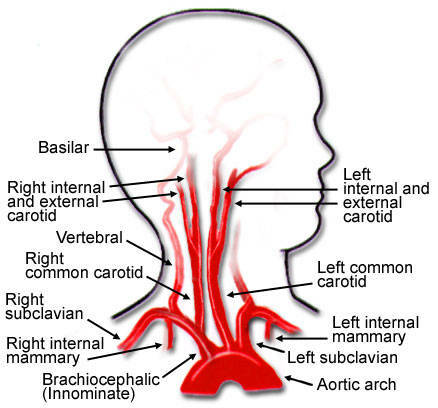 It is the internal carotid artery that supplies blood to the brain, while the external carotid artery is responsible for the blood that goes into the face and neck. There are arteries that can be found on both sides of the body, and these are the right subclavian artery and the left subclavian artery. They form the internal thoracic artery, the thyrocervical trunk, the vertebral artery, and the costocervical artery. At the lateral first rib border, the subclavian artery becomes the auxiliary artery, while the subclavian artery on the left provides the blood that goes to the left side of the upper chest and the left arm.